The adjective “Orwellian” is widely used – and misused. 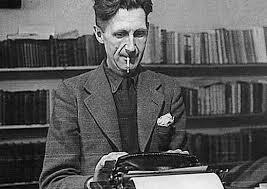 We shall explore its meaning by discussing, in general, George Orwell’s later novels and extracts from essays. (You do not have to have any of these). Then we shall turn to a novel by a Nobel prize-winner in which discontent is rife in America. From the political margins appears a charismatic presidential candidate, an ‘inspired guesser at what political doctrines the people would like’. Sweeping to power he promises wealth for all and the dawn of a glorious new era. As the president becomes increasingly autocratic, some are worried. And then, we turn back to Orwell, to the novel published as the world was going to change. It can’t happen here (1935) by Sinclair Lewis. The eight-week course will finally look at a more recent dystopian vision of American, by one of its leading writers. Day: Wednesdays Time: 1.30-3.30 pm. Dates: 8 weeks, from April 26th-June 14th, 2017. *If you have a valid annual entrance ticket to the Elizabeth Gaskell House. Day: Fridays Time: 10am– 12pm.